The Big Idea: Puzzles can help develop cognitive skills such as visual memory, spatial relations, and problem-solving. Puzzles are a great way to help kids build cognitive skills like problem solving, spatial relations, visual memory, and shape recognition. You can make your own puzzle by cutting apart any picture, even a page torn from a magazine. Print this page and have kids color it. Then cut it apart. 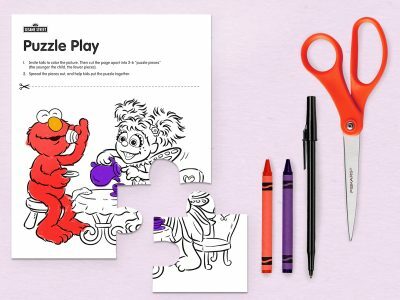 The puzzle pieces don’t have to be fancy; you can just cut a few straight or zig-zag lines (kids can do the cutting themselves, too). Then, help kids put it back together.